My mom got me a dehydrator for Christmas a few years back and so this past summer I dehydrated a lot of our tomatoes (and anything else I could get my hands on!). I really like dehydrating as a means of preserving food because it’s easy, it takes up little space and it keeps nutrients intact since the food never experiences high levels of heat. Also, it makes very little mess and doesn’t heat up the kitchen like canning. When I started dehydrating my own food I looked to the internet for inspiration, but couldn’t find a whole lot so I’ve had to come up with recipes on my own and that is where this tomato sauce comes into play. It’s a basic recipe that can be adapted to your family’s tastes or according to what you have on hand. I whip up a batch of this whenever I need it and haven’t had to buy store-bought sauce in a long time. Step 1: Bring 1.5 cups water to boil. Step 3: Add all ingredients to blender and process until smooth. Have you ever dehydrated anything before? If so, what have you dehydrated? I’d love to know! Bring 1.5 cups water to boil. My husband bought me a food dehydrator for Christmas this year. I have had a great time with it. My favorite thing so far is sun dried tomatoes, I put them in olive oil after I dehydrate them. It's so easy to do and saves so much money! I haven't tried making tomato sauce, but yours looks great. I have a NESCO Professional and I like that you can add or subtract trays at anytime, but it seems to take double or triple the amount of time that the instruction manual says to fully dehydrate something. I know that could have something to do with the humidity in the air, thickness of food, etc. I have dried tomatoes, potato slices & chunks, mixed vegetables, onions/peppers and carrots. Many of the things have been from frozen foods that I got on sale & didn't have room for in the freezer. what recipe do you use for dehydrating your tomatoes? I cut my tomatoes approx. 1/4" thick and remove the pulp/seeds. Then I dry them in my dehydrator until they are brittle and store in an air tight container. The tomatoes shown in the picture are cherry tomatoes cut in half and then dehydrated. I finally made this tomato sauce last night. It was fantastic! My husband said it was the best tomato sauce he has had. We loved how thick and full of flavor it was. Thanks for sharing this recipe. I'm so glad you enjoyed the recipe Julie. Thanks for letting me know!! Looks and sounds delicious and easy....but what about the skins of the cherry tomatoes as a part of the sauce? We don't like chunky sauces or salsas and don't want to taste or 'feel' the skins of the tomatoes in the sauce. Thank you! I don't like skins either, but I didn't notice them in this particular recipe. I just tried your recipe, used a little less water and it turned out almost the same consistency of paste! Last year I spent DAYS in the kitchen going between crock pots and the oven to make tomato paste ... you just saved me a couple days of sanity during the hot humid days of ripe tomato season. Thank you!!!! Haven't tried it, but I bet you could cut the cook time by processing the tomatoes when they're dry. A powder has more exposed surface area, so it should take less time to for the water to penetrate. You could probably make batches of premixed powder too, with all the other ingredients already included. Just a thought. 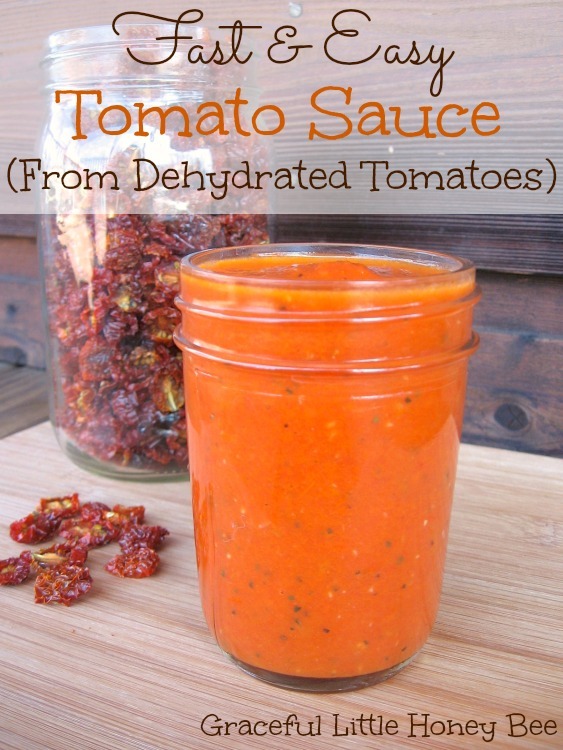 I can’t wait to try this with my dehydrated tomatoes!